Polycarbonate build plate…. No bed heat Success!!! Okay for those who have not seen my comments in other threads. Sanding 1/8 inch thick black polycarbonate with 60 grit sandpaper and a vibrating sander with water creates a surface which almost any filament well maybe all filaments we'll see adhere to without bed heat and without glues or tape etc. Acetal POM..... for those that do not know acetal pom is considered by many as unprintable, it is a self lubricating filament and great for things like bearings, bushings, gliders etc. 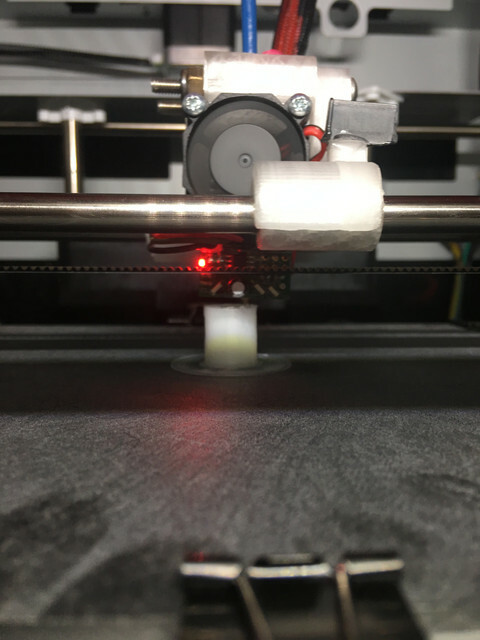 Today i decided to give Acetal POM a try on my polycarbonate build plate with 220c temp and 0 degree bed, I successfully printed a LM8uu bearing after turning off pressure advance. The next issue i was facing was warping at the edges even though the print successfully printed. First i did many different temps (lower made it not stick) then i printed a brim with the bearing and succesfully it printed without warping. i am digging this! maybe paired with a heated chamber to control shrinkage and warping? I've read about polycarbonate build plates before and the tenor was, the parts often stick too good. Maybe it's the sanding, that makes all the difference? Would it work with shotblasting too? I guess it depends on the stuff you shoot at it? I've made these 2040-sliders from PTFE, but POM would be much better I guess. to answer your question i bought it from Matterhackers but they quit selling it (most likely why) a google search will reveal the difficulties even with people claiming its unprintable. Gizmo Dorks still has it. where did you find ptfe filament? I will test both to see which one works better with the IR Sensor and I will sand them and make some tests… I will let you know how this progress :), I'm really excited about @whitewolf's PC bed, looks really promising. I have been runnning PEI 3mm from the start, prep with a quick sand @ 600 grit then wipe with alcohol. sticks very well and yes some times too good and i have to let the bed cool before i can get the print off but 750 watt heater might have something to do with that too. I havent tried anything but PLA yet, still learning the craft so have not jumped to other filaments yet as i thought it would be easier to learn with something easy like PLA is supposed to be… This shows real promise though so i am curious to say the least. Matterhackers has some flexibles that make printing with flex easier in their pro line. I tried PLA+ but gave up on it. It sticks far too well to plain heated glass and to PEI for me. Possibly I should try again with a lower bed temperature. But if you have problems getting the print to adhere to the bed, it might be just what you need. As far as the PC bed goes as noted above people in the past gave up on it due to sticking too well. What gave me the idea to try PC sanded was because of my Fleks3D build plate being made from PC with what appears to be a etched maybe sandblasted surface. Using any type of heat on most filaments results in parts which are near impossible to remove, I think a combination of the sanding and lack of heat is what makes it possible. Good idea sanding it, its a cheap readily available material. How well does it work with ABS? Can you print ABS cold onto PC? I have not done ABS, because I use other filaments in place of ABS but in another thread here a user commented that he tried it with ABS and 0 bed heat without issue. So I have not printed PC, I am printing on 1/8th inch PC build plate. Yes I have a copper heat block with copper nozzles and PT100 sensor. The PLA+ from RigidInk is just that rigid and very strong. It actually takes much different slicer settings to standard PLA (to my understanding). I have Taulman 910 but I recommend using Taulman Guidl!ne for your printer and sailboat parts. It is not sensitive to water absorption like the Nylons are and is stronger than their TechG and close to 910 in strength but a lot easier to print. Blueprint is another one to check out. thank you Sir! i will definitely look into that. I tried both ABS and PETG and both worked. Where did you find PTFE filament? I have searched and only see a press announcement of 3M's patent pending filament. So just to update everyone, I am in the early testing phase of Igus iglidur filament. First I tried with the settings used for the Acetal POM, I did use 55c bed heat with Acetal because combined with a small brim, it completely eliminated warping. For Igus Iglidur though it cause some serious bed adhesion so I am retrying now with no bed heat. One of the things that I found interesting is starting with the acetal pom temp of 220 which is the low end of iglidur, I did not get any layer adhesion and was able to seperate each layer. Inspecting it was interesting because at that temp it has a rough paper feel to it.